BDG architecture + design was tasked with the office design for price comparison website, MoneySuperMarket, located in London, England. BDG architecture + design was appointed by MoneySuperMarket Group to create a transformative scheme at its new 34,000 sq ft London office. The space, now home to approximately 250 employees, is a collaborative, smart, people-centric space with a focus on employee interaction. The lack of social areas in its previous office was identified as an issue for MoneySuperMarket Group, who expressed a desire to create a more flexible workspace in order to promote productive social interaction between co-workers. A major design feature of the new workplace were new stairs with designated ‘stopping points’ between the three floors, to encourage healthy movement around the building and provide the employees opportunities to integrate and communicate with colleagues in chance meetings. 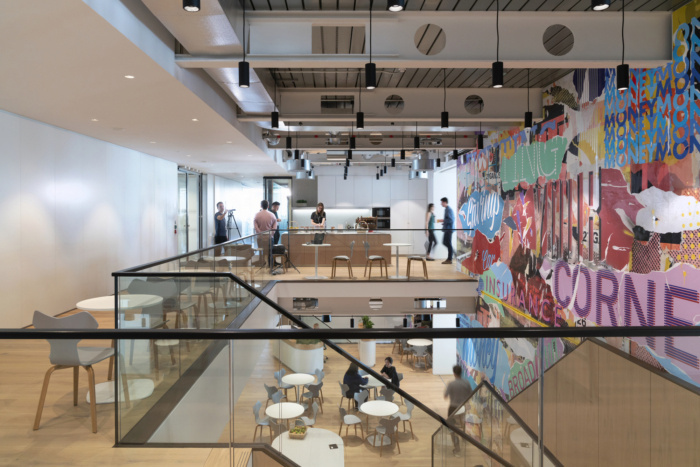 Continuing with its desire to promote a united workforce, BDG architecture + design created diverse communal areas that gave MoneySuperMarket Group staffers places to work. The spaces ranged from casual and informal breakout spaces, through to serious meeting and open working areas. The layout also allowed for visiting staff from MoneySuperMarket Group’s other locations to have sufficient drop-in spaces to collaborate and work.